This new map provides a useful spatial view of the change in distribution of dairying over a 70 year period - from 1944-2014. The distribution of dairying in 1944 was obtained from a map produced for the former State Regional Boundaries Committee's 'Report on Regional Boundaries' that shows three levels of dairy intensity (first, second and third) as well as associated factories at the time. 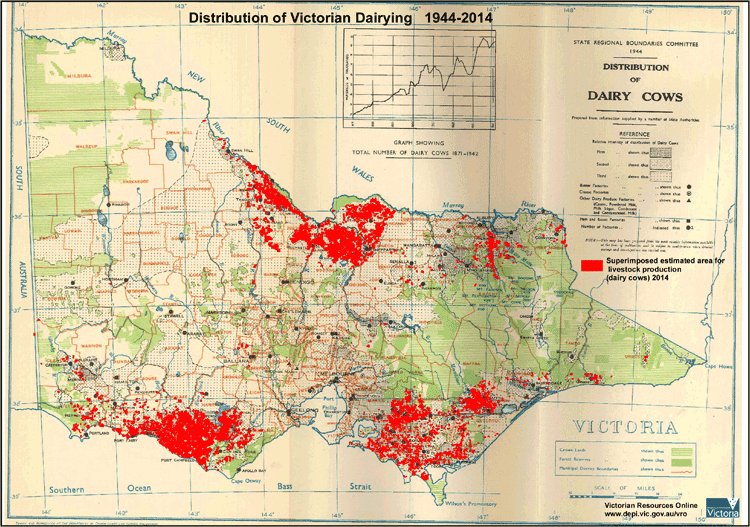 Superimposed over this map (in red shading) is the estimated 2014 distribution of dairy farms in Victoria obtained from the Victorian Land Use Information System (VLUIS). VLUIS data is a combination of satellite image interpretation as well as data from other government sources. The area of dairying has been produced by applying a 1 km buffer around polygons sourced from VLUIS. It should be noted that not all dairy farms may be represented in this 2014 mapped area and the map product will be improved on over time as new data becomes available.